As part of our aim to capture 21st century memories, we’ve interviewed the Inspired by Knole Project team, as well as its many advisers, consultants and contractors. Eddy Sackville-West’s suite of rooms opened to the public in June 2016, a milestone in the ‘Inspired by Knole’ Project. In this excerpt, recorded in 2015, Knole’s Curator, Emma Slocombe and James Finlay, Adviser to the National Trust on historic interior decoration, discuss their work on deciding on the colour for the rooms and their discovery of a shade of paint and its special finish. Emma Slocombe. : Well the work that James has been invited to do here, is really to help us, using his professional expertise, to understand the different layers of decoration that we might have in a space; to help us understand what that means in relation to the history of use of the space, which we can tell from looking at the archives. And then look at the property holistically; and find, in terms of our approach to redecoration, something that feels like a good fit for Knole: that feels right; and to make sure that we understand the significance of what we’ve got actually before we start changing anything. E.S. : And it would be lovely for me to hear from James: when we come into a room – we’re in Eddy’s bedroom at the moment; what the process is that you start to go through, just looking at the material evidence around us? James Finlay: Well I think when I came here, it was over 18 months ago, and I did my first bit of research in the Tower; what I was excited about, in this room particularly, is the survival of Eddy’s paint on the joinery – the blue joinery. And it’s extraordinary that it was painted in 1926; and it’s still looking surprisingly good. I mean it is dusty: it’s not as crisp as it should be, but it’s there, and it’s great evidence. I haven’t yet completed the research in here, so I’m not entirely certain on the walls; but just the fact that that bit of decorating has survived. And there’s quite a lot else as well, in the Tower as a whole, that’s survived from Eddy’s time. And it’s really because the Tower’s had a fairly patchy history since he left – since really the mid-20th century. And certain things have been redecorated, but bits have been left behind; it’s been a bit piecemeal. But it’s a great window onto his taste; and what he was trying to do. And it was really pretty sophisticated; certainly would have looked probably a bit brash, compared to the taste at Knole at the time. It’s rather fun! E.S. : Yesterday, we were just looking at different techniques used in this space; and you described to me the stippling technique that was used to decorate the shelves. J.F. 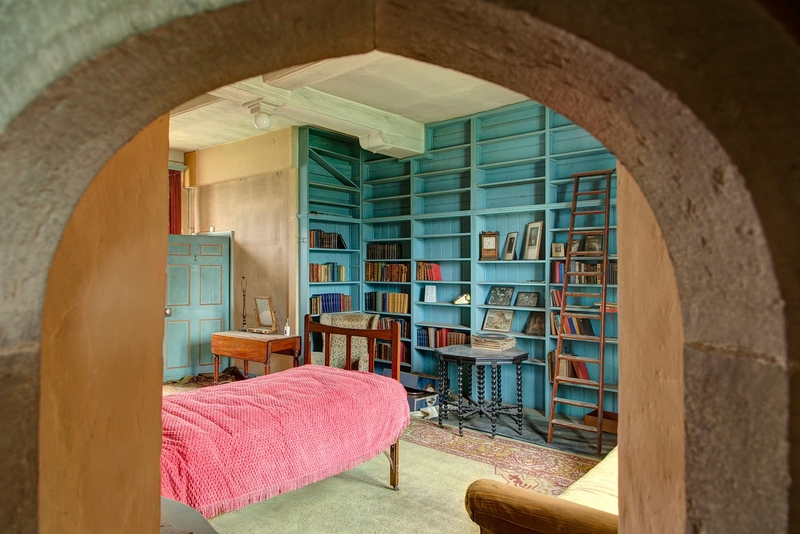 : The joinery – this blue joinery – has got a stipple finish, as Emma is saying; and it was quite fashionable in the ‘20s; it grew out of an attempt to use lead paint in a very even way – so it would be gently stippled to soften the paintbrush marks, and even out the colour. But in the ‘20s it sort of took on a life of its own; and it was used as a finish in its own right; and the paint was slightly thinned down and deliberately placed over a slightly paler undercoat; so a gave the colour a bit more of a glow. The memory, I suppose, of stippling and these paint effects has been slightly tarnished by a revival in the ‘80s – ‘Paint Magic’ was the book that did the reviving – and it started a whole trend for rather more showy paint finishes. But this is really nice, and it’s really subtle; and the blue now, that we’ve got, still has got this lovely glow to it. It’s really good.